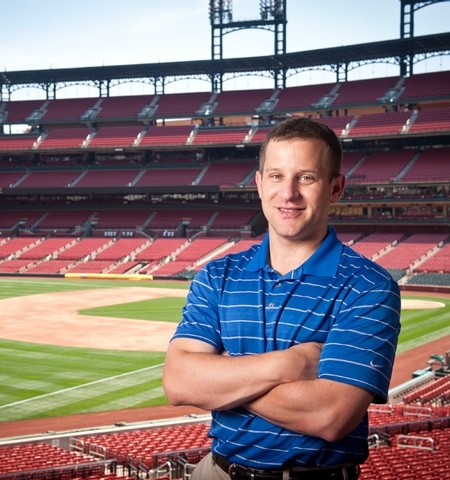 To be frank, Kantrovitz has one of the most important positions for the St. Louis Cardinals, and it does not involve playing on the field. Rather, he is the team’s Scouting Director. In 2012, he was named to the position–replacing Jeff Luhnow who was hired as the general manager for the Houston Astros. St. Louis is his hometown, and he got his start with the organization as an intern while he was still in school. He played in the Cardinals farm system, but a shoulder injury abruptly ended his playing career. Before getting a job with the Cardinals, he worked for the Oakland Athletics as the international scouting director. I could provide much more information about Mr. Kantrovitz, but to be honest, I think you all have heard enough from me over the past few months. I was lucky enough to ask him 13 questions, and though extremely busy with the trade deadline and various high school showcases, Mr. Kantrovitz was able to answer every single question thoughtfully and candidly. stlCupofJoe: How has it been replacing such a well-known, respected person in Jeff Luhnow? Kantrovitz: I probably underestimated how difficult it was to replace somebody who did as good a job as Jeff. It’s a lot easier to walk into something that is bad and make it better than to take over something that is good and keep it good. But, a big reason I took this job was because of the challenge of this role…I knew it was not an easy situation to walk into. Once people see the results of our recent drafts, I’m hoping Cardinal fans will continue to be excited about our pipeline of prospects and the work of our scouting department. S: I see that you have a degree from Brown and a statistics master’s from Harvard, how influential have both been in your job as scouting director for the Cardinals? K: Like most people my age, I’ve probably forgotten a lot of what I learned as an undergrad so I can’t say what I learned at Brown is all that influential at this point in my career. Although, with grad school being more recent and applicable to what I do, I’ve found it to be pretty helpful. Being able to go back and forth with our stat guys in their language can come in handy. Also, having a background in stats enables me to really get into the nitty-gritty of our stat models…and be able to, hopefully, make more informed decisions on draft day. This past year, as the draft was unfolding, I can remember a couple times when Mo and I would leave the draft room and go into his office to call an agent or talk to Mr. DeWitt. And, I would have my laptop open plugging data into various stat models or doing some sort of scenario analysis…things that maybe I would not have been able to do before getting some training in stats. S: I know that the Cardinals stress advanced analytics when scouting players, but to what degree? Does firsthand scouting of a player still play a key role as a complement to analytics? K: Without a doubt. You can run a draft without analytics. You can’t run a draft without scouts. That said, I think we leverage scouting analytics as well as anybody. S: What are some of the major differences in the way you run things compared to the way Jeff Luhnow ran things? K: I don’t think there are any major differences. We both value the analytical component of evaluating amateur players. We both value the opinion of scouts. And, I think we both subscribe to the school of thought that in order to really understand the amateur market, you need to invest a lot of time and energy out in the field scouting players. The last point is something that, after working under Jeff for 4 years, probably left the most lasting impression on me. I think he gained the respect of “baseball people” by spending countless hours out in the field scouting players, and I think that was vital to his success as a Scouting Director…and I’m sure as a GM too. I try to emulate a lot of the ways in which he approached this job. S: While in Oakland, what was it like dealing with Billy Beane? Also, do you stay in touch with him at all? K: Billy is a natural leader who is obviously very smart and just a lot of fun to be around. I definitely stay in touch with all those guys – Billy, David and Farhan. I invested a lot of sweat equity over there and learned a ton from all of them; they are as good as it gets in the baseball business, and it’s not surprising to me at all that Oakland continues to be successful despite limited resources. S: What is your favorite part of the job? Analyzing the heaps of numbers? Watching players firsthand? Draft Day? K: Watching players is what this job is all about, and that is what we do all year long but I would have to say draft day is the most exciting. It’s hard to describe the feelings and intensity of it, but just knowing that I’m playing a part in the future success of the Cardinals is very meaningful and fulfilling. S: Keith Law recently tweeted that Zach Petrick may project as a back-end rotation guy at the big league level? Your thoughts? What is your favorite part about Petrick so far? K: I hope Keith is right. As a scouting department, we devote a lot of time and effort into procuring the non-drafted free agents. Zach just reached double-A and while exciting, he still has a few more rungs on the ladder to climb. But his success thus far is a source of pride for all of us…scouts, coaches…. S: What does the shortstop position look like down on the farm? Any guys stand out at this point? K: Quite a few stand out. But a few that people may be less familiar with are 2 we just drafted – Oscar Mercado and Chris Rivera. Mercado has the potential to be really good. We are going to need to be patient, but I would not be surprised to look up in a few years and see that he is a top SS prospect. And with Rivera, he doesn’t get a lot of pub[licity] right now, but his ability to play SS should not be overlooked. He is getting off to a solid start and could be an interesting sleeper. A third player people may not be as familiar with is a guy we just traded for, Juan Herrera. He has some of the best defensive skills in the system and is fun to watch and definitely worth keeping an eye on. S: What is the organization’s thoughts on Carson Kelly‘s development thus far in pro-ball? After all, he is still just 19 years old. K: I’m not going to speak for the entire organization but for me, he is pretty special. Give him a couple years, and I think he’ll be on his way to being an impact big leaguer. S: What’s a regular day in the “office” like for Mr. Kantrovitz, scouting director of the St. Louis Cardinals? K: You make my job sound a lot more glamorous than it really is! Lots of travel and lots of baseball are really the only 2 constants. But to give you an idea, last week I was with the big league club in Pittsburgh spending the majority of the time holed-up in Mo’s hotel suite discussing various trade scenarios. This week I’m in Syracuse, New York, watching the top high school players in the country play 3 games a day. Next week, I’ll be in California scouting more amateur players. The following week, I’ll be back in the office. One of my favorite things about this job is that there really isn’t a regular day or week. S: How rewarding is it to see a player you drafted work his way up through the system? K: I never would’ve imagined that we would have seen one of our 2012 draft picks in the big leagues less than a year after being drafted. When our scouts came in town for the pre-draft meetings this past June, it was pretty special to share the experience of seeing Michael Wacha pitch in Busch Stadium. And just knowing all of the people who contributed to his selection were all there together was really rewarding. S: How often are you in contact with GM, John Mozeliak? On a daily basis? K: Yep, daily. If I’m in town, I’m likely in his office a few times a day. If I’m out of town, phone calls or emails are exchanged a few times a day. S: What is your opinion of the book/movie, Moneyball? K: My wife and I went to the “red-carpet” premiere which was my first and probably only movie premiere, but how could you not like the movie after attending an event like that! I thought it was pretty cool to introduce my wife to Scott Boras and then turn around and do the same with Bill James. As a Scouting Director, I guess I’m not supposed to be impressed with Scott Boras but needless to say, I was way over my skis in that crowd. Thus, that concludes the best “interview” I have ever had as a Cardinals blogger. It also probably highlights my blogging career thus far. I cannot thank him enough for his thoroughness in his responses, and it speaks volumes for the Cardinals’ organization as a whole. Luhnow was a great Scouting Director for St. Louis. However, after reading these responses, I am 100% positive the Cardinals are in good hands with Mr. Kantrovitz.